Some months ago I was sitting in my living room, watching X Games and chatting with a friend of mine via Skype. Around midnight I noticed rumbling thunder from far away. 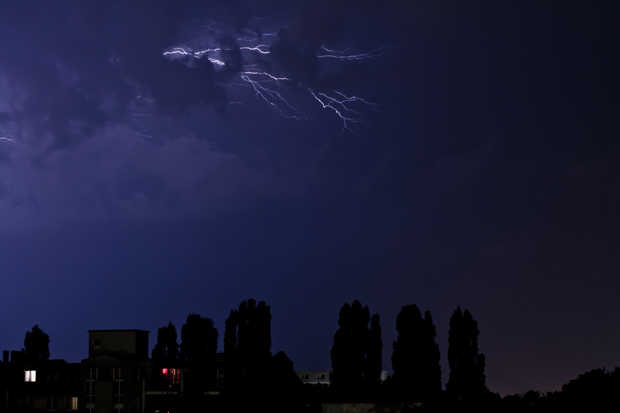 So I mentioned to him that there will be a thunderstorm soon and how cool it would be to photograph the lightnings. I started thinking about what’s the best method to catch the lightning on photo at the right moment. It was all entirely learning by doing. Now I want to share this with you. Thunderstorms are one of natures most dangerous phenomena. Due to that you should always be aware of your own safety during shooting. If you shoot outside, try to shoot from a bit more far away. Don’t get yourself in the middle of a thunderstorm. If you have to be in the middle of the thunderstorm try to go somewhere inside, where you have shelter like your home or similar and shoot through the windows. Just use a polarizing filter to get rid of the unwanted reflections. That’s what they are made for. This is completely up to you. You decide, what you want to have on photo. To make the photo more interesting you should setup the field of view in order that you have the horizon in it. This way you get the Lightnings, that hit the ground too, not just the ones that are in the clouds, like in the picture below. 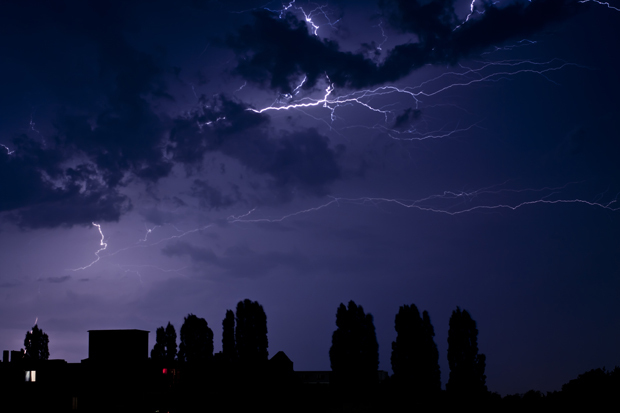 Unfortunately thunderstorms are highly unpredictable as most things in nature. Thus there are no settings that will work every time. Every thunderstorm is different and you will always have to tinker around until you have the set- tings that fit the situation the best. One of the few more or less constant settings is the ISO. This is in most of the cases at around 100 but not above 200. Set the cam to Bulb Mode. If you don’t want to hold the shutter release as long as the exposure takes, grab your laptop and your favourite software to remote control your camera. This way you also avoid unwanted camera shaking. When you have setup your gear the way you want, you can release the shutter and wait, until the lightning strikes. After that you should stop the exposure and look at the photo you just took and tinker around with the settings if needed. Below I have some of my lightning photos and the settings. These settings are no magic bullets to get the picture the way you want, but you can use them as a kind of orientation.